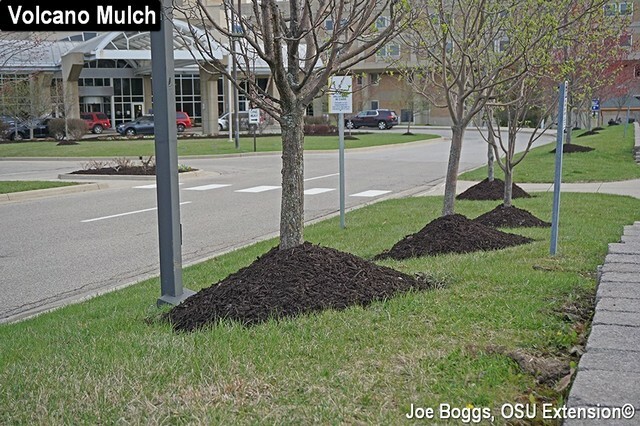 OSU Extension » Fairfield County » Avoid the temptation to apply mulch too early! Each year homeowners spend hundreds – and, in some cases many hundreds – of dollars on mulch for the landscape. When properly applied at the right time, mulch has its place. A thin layer of perhaps 1.5 to 2.5 inches of mulch can enhance the color of the landscape, aid in preventing weed germination, retain moisture in the soil, and moderate soil temperatures in the root zone of the plants being mulched. As mulch decomposes it also adds organic matter to the soil’s surface. However, if applied to cold soil in the very early spring, mulch will prevent the warming of the soils in a timely fashion, reducing early season plant growth. And, if applied too early to wet and cold soils, problems are often times compounded! If mulch is applied to wet soils, or applied too deeply over poorly drained soil the moisture is sealed in. At a time when plants are trying to break dormancy, by maintaing wet soil longer into spring, mulch quickly becomes a detriment to plant health. The potential for further compounding the problem exists if we receive an abundance of spring showers throughout Fairfield County. Waterlogged mulch that retains too much moisture in the soil can be as problematic as poorly drained soils are to plant health. Except for immediately after a rainfall, an ideal soil has approximately 50% pore or air space. Frequently we find places where mulch was applied heavily on top of old mulch or what may have been poorly drained or wet soil to begin with, we don’t have that healthy environment throughout the plants’ root zone. This was particularly true last year and considering the abundance of soil moisture we've experienced since then, its likely to continue unless soils and mulch are managed carefully. Once soaked deeply, neither the mulch nor the soil has the opportunity to dry out enough to allow for a healthy soil structure with the mixture of air and soil that’s desired. Waterlogged soil commonly leads to decline in the health of the mulched plants later in the year. Mulch and the soil conditions under the mulch needs to be checked for moisture. In cases where soils remain waterlogged, there is little recourse aside from pulling the mulch back off the soil and allowing it time to dry. Once soil dries and conditions become more desirable for plant health in the root zone, the mulch can be returned. When the time comes for re-mulching, it’s important to keep a few things in mind. First, if the goal is to enhance the color of the landscape, mulch only needs to be applied an inch or two thick. Second, mulch should be kept away from tree trunks and not allowed to build up at the base of shrubs, especially relatively shallow rooted plants such as azaleas and boxwood. Mulch piled against shrubs will cause them to grow roots into the wet mulch, and when the mulch decays or dries, the roots are left in a zone suddenly void of moisture. 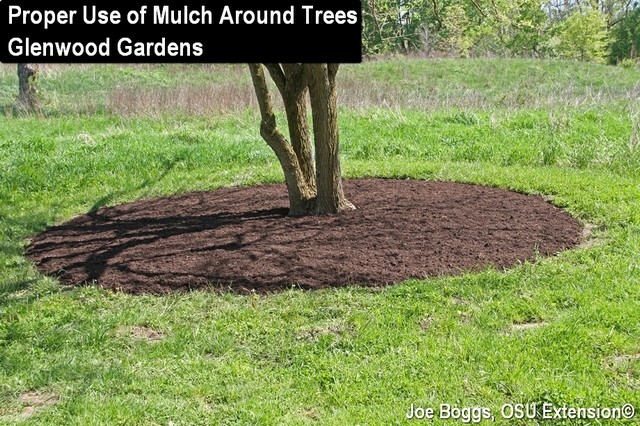 The mulch volcano, as we sometimes affectionately call that deep mound of mulch piled at the base of a tree trunk, has become somewhat of a phenomenon that some local landscapers and homeowners have embraced in recent years. Unfortunately the mulch volcano is in no way related to the needs of the tree. Instead, mulch piled against the lower trunk can become waterlogged and eventually compacts and interferes with oxygen reaching tree root cells, promotes decay of the tree's bark, can harbor rodents that chew on the base of the tree, and often times cause roots to grow detrimentally. 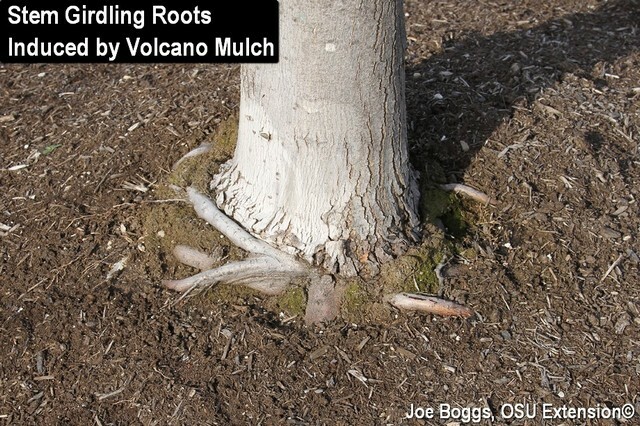 While mulch volcanos alone seldom kill a tree, they do result in long term effects that eventually cause decline of the tree.